More than 11,000 people participated in over 100 events across Waterford, Tipperary, Wexford and Kilkenny during November for National Science Week. The South East Science Festival - the regional celebration of National Science Week - was coordinated by Calmast, Waterford Institute of Technology’s (WIT) STEM outreach centre with support from SFI and local industries GSK, MSD, Bausch and Lomb, Sanofi, and EirGen Pharma. “Science is for all – and Calmast brought science to all through the South East Science Festival”, says Calmast director Sheila Donegan. There were activities for schools, afternoon shows for families and evening events for the general public. In addition, Calmast exhibited at the Wexford County Council’s WexSci Showcase event with about 1,000 visitors attending. Local, national and international high profile researchers, science communicators and performers presented shows, talks and workshops at WIT and at schools, libraries, theatres and pubs across the region. “This year’s South East Science Festival was a huge success," says Calmast programme manager Cordula Weiss. "We had a large variety of events – from circus performances explaining how circus artists used gravity to unicycle, juggle and balance to bubble shows for all the family where everyone got a chance to stand in a giant bubble, and evening events at local pubs to learn about the science of gin. It is only because of the support of many groups and companies in the region which enables us to make science accessible to all through such a variety of events. There was something for everyone." For the first time, evening events took place in the comfortable atmosphere of local pubs. WIT researchers presented their projects in layman’s terms at the Munster Bar, while Blackwater Distillery director Caroline Senior explained the science of gin to Network Ireland members at Tully’s Bar. Science is for all and this is what Science Week was all about. With the support of an interpreter, Mariana Gavendova and Thomas Byrne, postgraduate researchers in chemistry and health sciences at WIT, delivered an exclusive workshop on the human body to a group of Syrian children in primary school age. The children learned the English expressions for different body parts and organs, they got to know the inside of a human body, they studied how the systems of our body work together, and they enjoyed an engaging and fun morning outside the classroom. In cooperation with the Waterford Area Partnership, Calmast invited DEIS schools in the region to come to the South East Science Festival. Pupils who wouldn’t have had access to science events otherwise were able to attend the London Science Museum’s show It Takes Guts at WIT, thus becoming aware of what science means to us and the importance of a balanced nutrition, while becoming aware of the many opportunities WIT offers through many courses. The first show was opened by Minister John Halligan and WIT president Prof Willie Donnelly. Events for families included a fast-paced circus performance by juggling scientist and Guinness World Record holding juggler James Soper who enthralled and inspired an audience of about 500 at the Theatre Royal. In Lismore, Calmast and the Lismore Heritage Centre engaged young and old in magical chemistry experiments and intriguing maths puzzles at the Sunday Funday for families. During the week, the London Science Museum presented their ever popular Bubble Show and It Takes Guts, the “most disgusting but also the very best show ever” as many pupils declared. 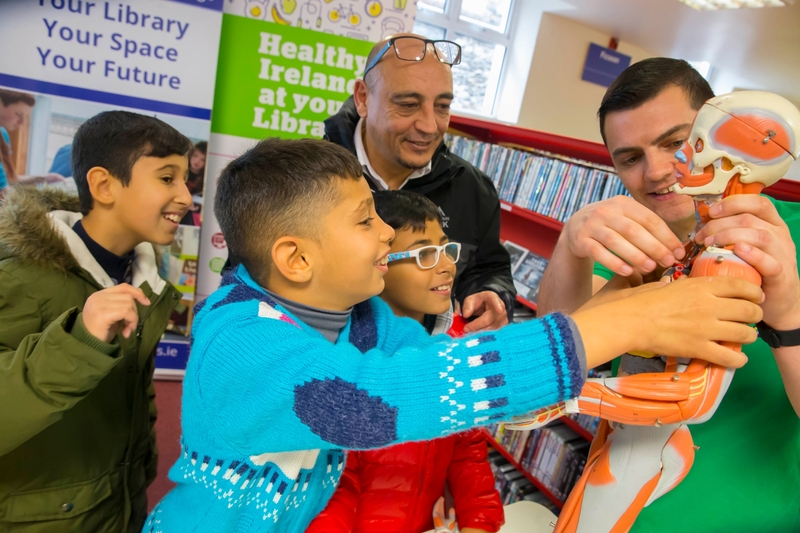 Additional family events took place in libraries in counties Waterford, Tipperary and Kilkenny while primary and secondary schools were invited to attend lectures, shows and workshops during the day at venues all across the South East. 13 transition year students from Waterford, Tipperary, Kilkenny, Wexford and even Westmeath helped at events and were trained to deliver events themselves. They ran workshops for primary schools at libraries across the South East. Everyone has an idea of what science is and means to them – science can be a career and it can make life easier. WIT staff and students captured their own idea of science as part of the South East Science Festival’s Snap Your Science competition with striking results. It was hard to find a winner as all the entries were well thought out and of high photographic and scientific quality. Congratulations to PJ Cregg who won with his entry Droptics and to the runners-up Jenna Lee, Rebecca Power and Daniel Samair. The ever increasing number of events and participants shows how keen people are to learn more about science, how important it is to introduce science and develop curiosity at an early age, and highlights the possibilities WIT and local companies offer to those considering a career in science. All events were free to promote access, which is courtesy of resources that WIT puts into the events with the support of major sponsors SFI and local sponsors.